Forest ungulates in West Africa are common bushmeat species and are subject to habitat degradation through deforestation. Based on historical data, there are possibly 12 species of forest Bovidae and Tragulidae found in eastern Sierra Leone. We used camera trapping to assess occupancy by forest ungulates on and around a small protected area, Tiwai Island, Sierra Leone. We then assessed habitat over two field seasons during 2008-2011 for those species where we had sufficient numbers of detections. We detected 6 of 12 potential species and obtained enough data to further assess the habitat of two species. Species detected included the black duiker (Cephalophus niger), bongo (Tragelaphus eurycerus), bushbuck (Tragelaphus scriptus), Maxwell's duiker (Philantomba maxwellii), water chevrotain (Hyemoschus aquaticus) and yellow-backed duiker (Cephalophus silvicultor). Among detected species, the bongo is considered near threatened. Several of the species not detected might be extirpated from the region, but for several species we found no records of them in the area. For the two species with sufficient detections for analysis, we found that Maxwell's duikers were common throughout woody and swamp habitat and yellow-backed duikers preferred old growth forests with open understory. Despite widespread deforestation in Sierra Leone, a recent civil war and continued bushmeat trade, it appears that small wildlife refuges such as Tiwai Island continue to provide sanctuary for many of the forest ungulates of the region. Conservation implications: The Guinea Rainforest ecosystem of West Africa has undergone significant human impact and deforestation, negatively impacting all aspects of the biodiversity of the region. In addition, a long-standing civil war in Sierra Leone further exacerbated conservation concerns of many wildlife species. There are some recognised reserves in Sierra Leone, but small reserves managed by local people and conservation organisations have a role to play. Our work on Tiwai Island, along the Moa River in Sierra Leone, demonstrated that a significant proportion of the forest dwelling ungulate biodiversity of the region has been maintained in a small reserve despite isolation and effects of the war. Our work also suggests that Tiwai Island continues to have significant ecological value for ungulate conservation in the region and should be considered a model for establishment of other small reserves to help maintain the region's biodiversity. The Upper Guinea forests of western Africa contain some of the most diverse animal species on Earth and are global hotspots for conservation (Klop, Lindsell & Siaka 2008). Several species of ungulates are endemic or near endemic to this area. The westernmost block of the Upper Guinea forest stretches into Sierra Leone, and although there are some protected areas, such as Gola Forest National Park, forest ungulates are experiencing decreasing population trends within the area (International Union for Conservation of Nature [IUCN] 2015). Few studies have been conducted on duikers and other forest ungulates of western Africa, although they are a major food source for villagers in many rural forested areas (Anadu, Elamah & Oates 1988; Newing 2001). Several species may inhabit the same habitat with little interspecies competition by isolating themselves temporally, spatially and by body size (Newing 2001). There are 12 forest ungulate species that could possibly be found in the Upper Guinea forest of Sierra Leone: Maxwell's duiker, black duiker, water chevrotain, yellow-backed duiker, bushbuck, bongo, zebra duiker (Cephalophus zebra), Jentink's duiker (Cephalophus jentinki), red-flanked duiker (Cephalophus rufilatus), Ogilby's (Brooke's) duiker (Cephalophus ogilbyi), African forest buffalo (Syncerus caffer nanus) and bay duiker (Cephalophus dorsalis). Even though all 12 species are found within forested habitats, some are much more adaptable to human encroachment, hunting and deforestation. In this research, we will collectively refer to them as 'forest ungulates'. Duikers and other forest ungulates are commonly utilised for bushmeat in rural areas throughout Guinea Rainforest, bringing food and an economic benefit to people of all social statuses (Anadu et al. 1988; Newing 2001; Ripple et al. 2016; Wilkie & Carpenter 1999). Domestic livestock have difficulty surviving in the humid, dense rainforests of Sierra Leone and Guinea, and in some areas the taste of bushmeat is preferred to that of domestic bovids (Anadu et al. 1988). Maxwell's duikers are a particularly common species for the bushmeat trade in the past few decades and are regarded favourably by consumers (Anadu et al. 1988). However, it is unclear how development and alteration of the landscape affects many ungulate species commonly used for bushmeat. The purpose of this study was to determine occupancy of the Tiwai Island region by forest ungulates. To focus on bovid-related species, the red river hog (Potamochoerus porcus), although observed, were excluded from this study (McCollum et al. 2016). 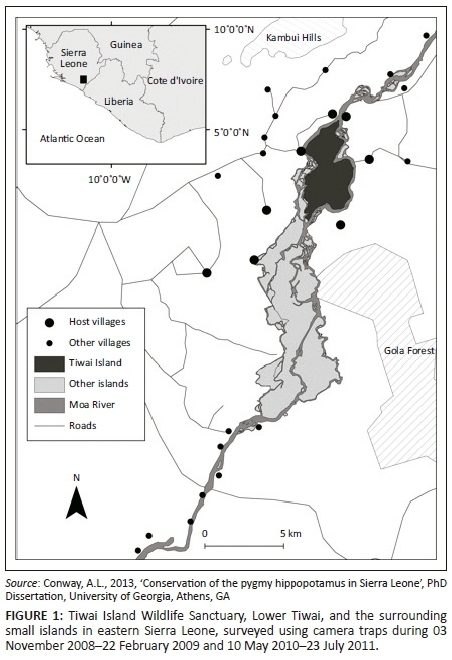 Our study was conducted on and around the Tiwai Island Wildlife Sanctuary in southeastern Sierra Leone (Figure 1). Tiwai has an area of 12 km2 and is located on the Moa River, including two islands, Upper Tiwai and Lower Tiwai (Conway 2013; Oates et al. 1990). The climate is wet and warm, typical of Western Guinean rain forest, with an average annual rainfall of 3000 mm. A distinguishable dry season takes place between December and March in which the temperature averages 30 °C. The island has tropical vegetation consisting of old forests, regenerating secondary forests and swamps (Fimbel 1994; Oates et al. 1990). The island is managed as an ecotourism site with a non-government organisation with proceeds contributed back to surrounding host villages. This encourages them to cooperate with conservation priorities of the area rather than clearing it for farming or exploiting other resources (Conway 2013). Camera traps were employed to detect duikers and forest ungulates because of their efficiency in collecting data on elusive or shy species (Swann et al. 2004). To select locations at which cameras were installed, the island was mapped out in fifteen 1 km2 grids (Figure 1). Within each grid section, a Moultrie Game Spy camera was placed at a random location and set up to take two photographs (with a 10 second delay) upon trigger by movement. The random locations were selected using a geographic information system (ArcGIS) and cameras were attached to trees facing down trails at or near the selected point. There were two field seasons: 03 November 2008-22 February 2009 and 10 May 2010-23 July 2011. The first season and six of the periods in the second season were conducted on Upper Tiwai, while two of the periods in the second season were conducted on lower Tiwai. For field season 1, the cameras were set up for 14 days before relocation to another location. For field season 2, the cameras were employed for 21 days before relocation. Species of duikers and ungulates were identified from the images captured by cameras, and each species was recorded as detection (1) or non-detection (0). Data were combined into two 7-day periods for season 1, and three 7-day periods for season 2, in which one or more detections within the 7 days warranted presence in the period. On the lower island, there were delays retrieving the cameras, which continued to collect data for 10-12 days after the end of the third period. We extended the detection time frame to three periods in season 2 to potentially capture more rare events. Although possibly making the models more robust, we controlled for possible detection bias by analysing the data with season as a covariate. For species with sufficient detection, data were modelled using program PRESENCE for analysis, and the success of the habitat parameters was compared. Five habitat covariates were used in modelling occupancy: the understory density (Cover), understory type (Understory), canopy type (Canopy), whether the camera was on a human, animal or no trail (Trails) and the standardised distance to the Moa River (distMoa). Covariates had multiple parameters: cover was classified as open, semi-dense or dense; understory was woody, swamp, riparian or bush fallow; canopy was young secondary, mature, swamp, riparian or bush fallow; and trails were human trail, animal trail or no trail. We measured the strength of our models using the Akaike's Information Criterion (AIC), which represents the goodness-of-fit of the models. The models were compared using the change in the AIC value (Δ AIC); the best-fitting model had a Δ AIC of 0.00, with the value increasing for less-fitting models. All models with a Δ AIC less than 4.00 were considered a good fit. We then calculated the occupancy probability and 95% confidence interval of each parameter. We detected 6 of the 12 potential ungulate species on Tiwai Island Wildlife Sanctuary and vicinity over two seasons (838 and 2474 camera-trap days, for seasons 1 and 2, respectively) (Table 1). 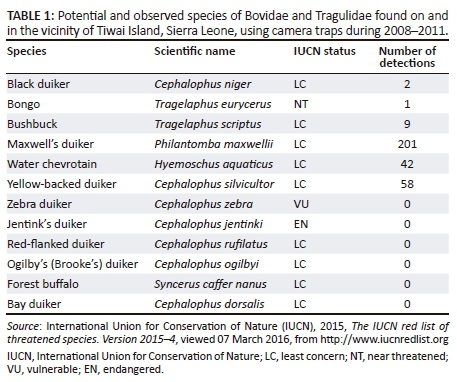 A total of 280 ungulate photographs were recorded at 100 of 180 sample locations on Upper Tiwai, Lower Tiwai and the smaller surrounding islands. Of the five habitat covariates, there were insufficient detections of any species in bush fallow habitat; therefore, that habitat was omitted from further analysis. Maxwell's duikers were the most commonly trapped with 175 photographs, or 5 detections per 100 trap nights. Yellow-backed duikers were recorded 55 times or 2 detections per 100 trap nights. Water chevrotains had 40 total detections or 1 detection per 100 trap nights. There were eight photographs of bushbucks, 0.24 detections per 100 trap nights. Bongo and black duiker were each detected once during the study, less than 0.03 detections per 100 trap nights (Table 1). Because of the insufficient detections, water chevrotain, bushbuck, black duiker and bongo were excluded from habitat analysis. In season 1, naïve occupancy estimate (ψ) was 0.30. Occupancy of Maxwell's duiker was influenced by both the distance to the Moa River and understory type (Table 2). In particular, the distance from the Moa River, strongly affected occupancy of Maxwell's duikers, β = 7.87. Maxwell's duikers appeared to prefer swamp and riparian understory, with ψ = 0.83 (±0.50 standard error [SE]) (Table 3). Occupancy was also high in woody habitat, with ψ = 0.77 (±0.35 SE). In season 2, the naïve ψ was 0.50. 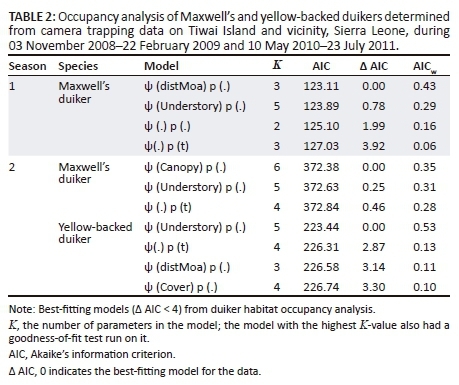 Occupancy of Maxwell's duikers was associated with canopy cover and understory type (Table 2). Swamp cover and young secondary growth were similarly preferred, with swamp having ψ = 0.75 (±0.28 SE) and young secondary growth having ψ = 0.71 (±0.09 SE). Mature canopy was also occupied often, with ψ = 0.65 (±0.11 SE). There were too few detections of Maxwell's duiker in riverine habitat for analysis. As observed in season 1, Maxwell's duikers preferred swamp habitat, with ψ = 0.83 (±0.25 SE). Occupancy of woody habitat was common, with ψ = 0.69 (±0.08 SE). Riparian habitat was not commonly occupied, with ψ = 0.28 (±0.17 SE) (Table 3). We did not have enough detections of yellow-backed duikers in any habitat during season 1 to run working models. However, in season 2, we obtained a naïve occupancy rate of 0.26. The best-fitting model of season 2 was understory type, although the only significant parameter was woody habitat with ψ = 0.70 (±0.21 SE) (Table 2). Occupancy of riverine or swamp habitat by yellow-backed duiker was infrequent with too few detections to assess. Occupancy was also influenced by the distance to the Moa River, β = 0.56. Yellow-backed duikers greatly preferred open cover, with ψ = 0.92 (±0.34 SE) (Table 3). Semi-dense cover occupancy was also common and had ψ = 0.51 (±0.24 SE). Dense understory cover was not preferred, with ψ = 0.30 (±0.23 SE). Forest ungulates can be secretive and solitary animals which make them difficult to detect and estimate abundance. Camera trapping provides access to these species and can assist in cost-effective conservation efforts in regions where dramatic changes in land use and other human activity might be rapidly impacting species. Our detection of half of the potential species that might be found in this region suggests that despite significant negative impacts of a long civil war, chronic deforestation in the region and continued bushmeat trade, at least some species are apparently quite resilient. Those species not detected might simply have been undetected, are extirpated or are marginal in distribution for the region or habitat. Based on known habitat, some species, such as forest buffalo; and zebra, bay, Ogilby's and Jentinks' duikers may have historically occurred in this area but were not detected during our study. Red-flanked duikers are more of a savanna edge species, but were included because they are found to the north of our study area, and might actually respond to deforestation in the region. In addition, we had very few detections of some important species, such as bongo and black duiker, which may have persisted at low numbers following the civil war or are recolonising the region from protected areas associated with the Gola Forest and further from Liberia. Water chevrotains had one of the largest numbers of detections, suggesting that they are commonly found in this protected area. They are not as commonly found in bushmeat markets as some of the duikers, but if larger species continue to be overharvested, hunters may turn to the smaller chevrotains (Anadu et al. 1988). We had very low detections of bushbucks, suggesting that they are not commonly found in the study area, although they are common in other parts of their range. Bushbucks are commonly hunted for bushmeat in Sierra Leone, and the species could be more threatened in western Africa than in the rest of its range, where they are often not hunted owing to superstitious beliefs (Anadu et al. 1988). We had two detections of black duiker. Very little is known about populations and activity of this secretive species, as they are often mistaken for other species (Klop et al. 2008). Oates et al. (1990) noted the absence of bongo on Tiwai Island prior to the civil war; however, we detected only a single young male in our study. This observation highlights the value of camera trapping as we had no personal observation of bongo in 4 years of research on the island. Our camera trapping survey demonstrated that Maxwell's and yellow-backed duikers occupy a variety of habitats. 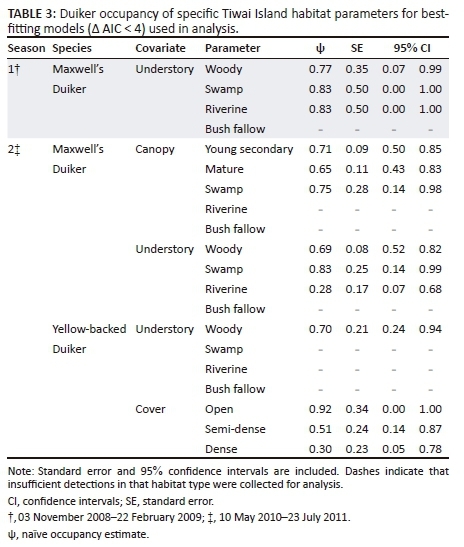 Riverine, woody and swamp habitats were similarly utilised during season 1, whereas in season 2 swamp was occupied most often, followed by woody habitat. Riverine habitat was occupied infrequently in season 2. This suggests that while they do use all three habitats, they may use them for different needs. Detections of Maxwell's duikers also changed dramatically during our camera trapping periods, suggesting that longer-term studies may be needed to study them fully. Yellow-backed duikers did not occupy the islands as extensively as Maxwell's duikers, and appeared more specific in their habitat preferences. They were detected in open woody, understory or old forests. Decreases in populations of yellow-backed duikers throughout this area could occur as human impacts on land use continue to meet increasing demands for food. Detection rates of yellow-backed duikers varied throughout the second season, suggesting that they utilise both Tiwai Island and the mainland, and perhaps often travel between the two. Long-term studies may be needed for this species to fully understand their habitat usage and range. As human activity continues to change natural landscapes, more species are losing suitable habitat and facing increased hunting pressure, resulting in decreasing populations. Bushmeat hunting is unlikely to diminish in the future unless other sustainable food sources are established. Illegal poaching makes it difficult to enforce hunting regulations, especially as the majority of poaching occurs in less accessible areas. In some areas, farming of wild meat species, such as the cane rat, has become an alternative to unregulated snaring and shooting. However, this management practice poses concerns for solitary species that do not reproduce often. Cryptic species are difficult to study and provide a particular challenge when trying to manage for conservation. We would like to thank the communities of Tiwai Island for their support, as well as the Tiwai Island Administrative Committee and the Ministry of Agriculture Forestry and Food Security for granting us permission to work on Tiwai Island. Finally, we would like to acknowledge the hard work of our local field assistants, Kenewa Koroma, Bockary Koroma, Alusine Koroma and Mohamed Lahai. K.R.M. analysed data and wrote the manuscript. E.B. summarised photos and wrote the first draft of the manuscript. A.L.C. designed the study and carried out field research. J.P.C. supervised the research, analysed data and wrote the manuscript. Funding for the main project was provided by Conservation International, Tulsa Zoo Conservation Grant, Minnesota Zoo Ulysses S. Seal Conservation Grant, Oregon Zoo Future for Wildlife Grants Program, Columbus Zoo Conservation Fund, Riverbanks Zoo Conservation Support Fund, OKC Zoo Conservation Action Now, Idea WILD, the Young Explorer's Fund and the IUCN Hippopotamus Specialist Group. Additional funding was provided by the Warnell School of Forestry and Natural Resources, University of Georgia and the School of Natural Resources, University of Nebraska.